Post subject: Samsung HM502JX USB Only? 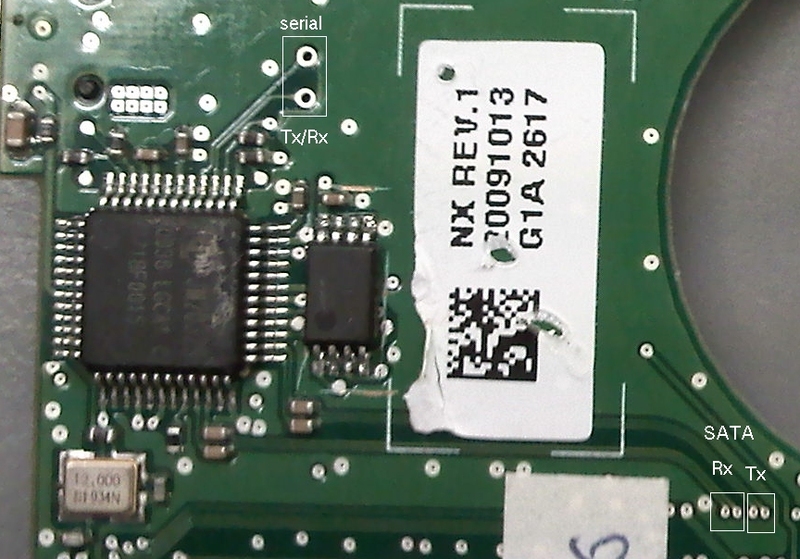 We have started seeing some of these Samsung 2.5" drives with only USB connectors on the PCB. No SATA or any other connectors. The one we have is a 500GB. Has anyone been able to find points on the PCB to access the drive via SATA or terminal? I have attached some PCB photos. We will give that a try and post back. ... suggests that the USB-SATA bridge is a JMicron chip. The VID and PID are 152d	and 2329, respectively. Internet searches suggest that the bridge is a JM20239. I don't understand the function of the UART pins, but I suspect they provide terminal access to the JMicron bridge chip. Please, do you happen to have one of these for sale. My friends HDD is still working but cant get through to the data ase USB connector from PCB was broken. I just need this PCB and I can save all the data. Can you help? A straight board swap probably won't work. The Marvell chip (big "M") probably contains adaptive data that would need to be transferred from patient to donor. The easiest solution would be to perform microsurgery on the connector. Was a solution ever found? Did the PCB swap work? I have this hard disk and my USB connector has broken off. Can someone direct me on how to hook up the sata points that are shown on one of the jpegs above? I have opened up a sata cable and only seem to have 4 wires + ground, I assume these are the TX+- and RX+-. Do I need to connect to the UA0 and UA1? What are they for? Also do I need to provide power to the board - I can do this through USB as I have been able to solder those sections from a USB cable but cannot solder the other parts from the USB cable. UA0 and UA1 are probably UART I/O pins. They are not required for your purposes, but I suspect they provide debug access to the CPU inside the bridge chip, or perhaps they can be programmed for a user defined purpose (?). Anyway, the Tx/Rx pairs are all you need for SATA access. I nearly managed it, I had everything soldiered but the one wire TX- wouldn't solder, lifted track, tried to salvage, then had to move to chip pin ... eventually snapped the pin off chip. I can't get any contact to the chip for TX-. So I guess this DIY has ended, although I could buy an identical and replace PCB, would this work, or can I make it work? Can anyone recommend an external hdd (laptop hdd size) that has a strong USB connector, they could have put glue over the connector to make it stronger!? This is the second usb connector to snap on me in the last 2 years. You could try a board swap. There seems to be some disagreement amongst the DR people as to whether Samsung drives need ROM transfers. I have seen threads, for other Samsung models, where a chip swap was required. BTW, which chip did you damage? Could we see the result? With regards to connecting to the terminal through the sata cables, is this sufficient enough to actually power the drive? Basically, the USB connector has fallen off, and from what i gathered the best cause of action is to connect through the terminal pins on the PCB board. The best course of action is to engage someone to resolder the USB connector. The drive needs to be powered from the USB +5V and ground pins. The "terminal" pins alluded to by Mikippp are for diagnostic access via RS232, not data access. If you follow the signal traces back to the JMicron bridge IC, you will see two pairs of capacitors. You will need to remove them. Consult the JMicron reference circuit to identify the individual signals. Can anyone update on whether replacing the PCB worked - I have the exact same issue. the usb connector broke, I have had it soldered back on but still not working, and I need my data, andyes, I know I should have backed it up!